Galaxy Digital is a merchant bank specializing in digital assets. It is an American company that seeks to institutionalize the digital asset and blockchain space, providing asset management, investing, advisory and trading services. 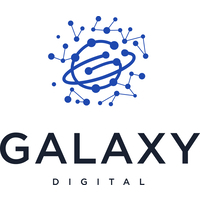 Galaxy Digital was founded by Michael Novogratz in January 2018. Since then, it has entered into business partnership with several companies to create institutional-grade cryptocurrency and blockchain products and services. In late January 2018, the company announced a joint venture with Block.one to create a $325 million fund in order to develop the EOS digital ecosystem. In June 2018, Galaxy Digital partnered with High Fidelity, an open-source distributed ledger virtual reality gaming platform. In July, the company announced a partnership with BlockFi, a company that offers fiat currency loans to digital asset holders to collateralize their loans with crypto. Galaxy Digital invested $52.5 million in venture capital. Later that month, the company announced that, mostly due to declining prices of crypto assets, it had lost $134 million in Q1 of 2018. In November 2018, Galaxy Digital announced that it had hired Ian Taylor, former real estate banker from Goldman Sachs, to help run a new branch of Galaxy's business involving the tokenization of real estate. The same month, Galaxy Digital reported a $76.65 million loss for Q3 of 2018. In January 2019, Galaxy participated in the series B round of investment for Symbiont. The round was led by Nasdaq and Citigroup Inc..
↑ Block.one and Mike Novogratz’s Galaxy Digital Announce Joint Venture for New $325 million EOSIO Fund. Block.one. ↑ High Fidelity Raises $35M to Bring Virtual Reality to 1 Billion People. High Fidelity. ↑ We are elevating these lending markets to a level of sophistication that meets the rapidly changing needs of retail investors and institutions. BlockFi. ↑ BlockFi Raises $52.5 Million with Galaxy Digital Ventures LLC. High Fidelity. ↑ Crypto Bank Galaxy Digital Loses $134 Million in Q1. Coindesk. ↑ Novogratz's Crypto Firm Turns to Tokenization of Real Estate. Bloomberg. ↑ Mike Novogratz’s Galaxy Digital Reports $76 Million Q3 Loss. Coindesk. ↑ Nasdaq, Citi Join Novogratz in Funding Blockchain Firm Symbiont. Bloomberg.